Yo Einstein, You Can't Even Protect Your Own Stuff! In the "most devastating cyber attack in US history" (see the UK Register story here), a security system elsewhere reported as being named Einstein royally missed the boat. The incompetence of the people chartered to protect our data assets (the CIA, the NSA, Homeland Security, the FBI) keep trying to build a case for getting more budget to protect us average citizens from cyber attacks. The Office of Personnel Management (aptly acronym'd OPM—spell the letters and you'll know what they're on) is running a COBOL system! Good grief, I worked my way through college in the late 60s writing COBOL applications. If anyone still wonders why I'm promoting the privatization of worldwide cyber security, just follow this story. 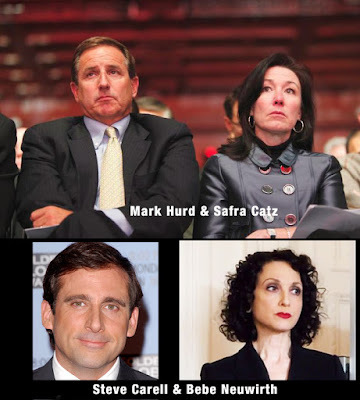 To the head of my Cyber Privateer Fantasy League, Larry Ellison, the story in last night's U. K Register magazine about Oracle revenue had a wonderful picture of your co-CEOs Mark Hurd and Safra Catz (see the story here). The resemblance to actors Steve Carell (from the movie Evan Almighty and others) and Bebe Neuwirth (from the TV show Madam Secretary) intrigued me enough that you could cast them in a ripping romp about Oracle. You, of course, would be played by Robert Downey, Jr. in a reprise of his Tony Stark persona. 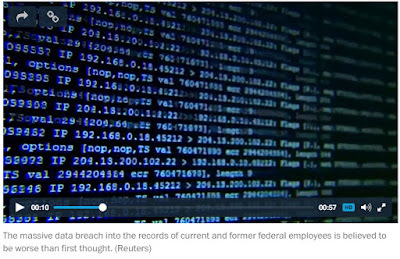 With due respect, the data breach that hit our Office of Personnel Management (see one of many stories, like in the Washington Post, here) represents a tangible clear-and-present danger to the Beltway-Bandit-business-as-usual mentality. And since you're clearly not enamored with the military industrial complex (one of the few things on which you and I have just a little bit of common ground), it's truly time you consider an alternative to all the federal cybersecurity hucksters with their palms out and their snouts dipped into the horn-of-plenty trough. Instead of bankrupting us with BIG TICKET solutions that obviously don't work, why not privatize worldwide cybersecurity and turn it into a way to completely eliminate the national debt on your watch. Licensed and bonded cyber privateers who adhere to a simple code (see it here) could solve the problem overnight. Think about it. Once again, proof that the MOSSAD is saving the world from a jihadist Armageddon. They installed their super-virus software in hotels that hosted the Iranian nuclear talks (see today's WSJ front-page/above-the-fold story here). How good is the Israeli virus toolkit? Hey, they penetrated super-sleuth virus gurus Kaspersky Lab ZAO with an improved version of Duqu. Yep, I'll say it's improved. One continuing request to my Israeli spookshop readers: How about you let us in on all the emails you recovered from Hillary Clinton's home server? I mean COME ON GUYS! Even the Russians hacked the White House email servers. Surely you can serve up some juicy tidbits from a much less well protected system in the Secretary of State's home. 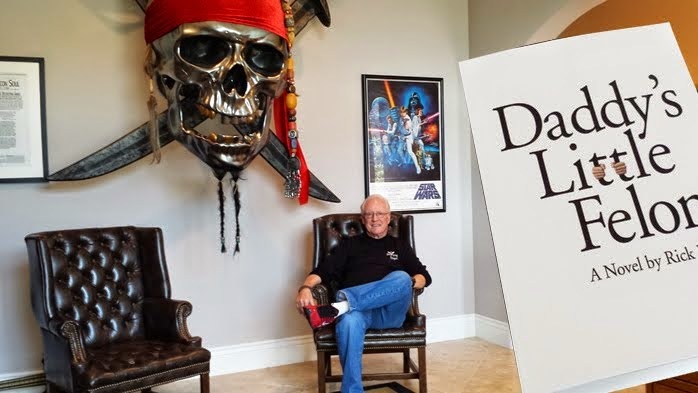 Data Exhaust: The Beltway Bandits Want Cybersecurity Dollars NOW! The combination of Wikileaks stories (see yesterday's U.K. Register story here)—plus the massive coverage of China's third breach in the last year of current and former government employees (see New York Times story here) plus N.S.A. 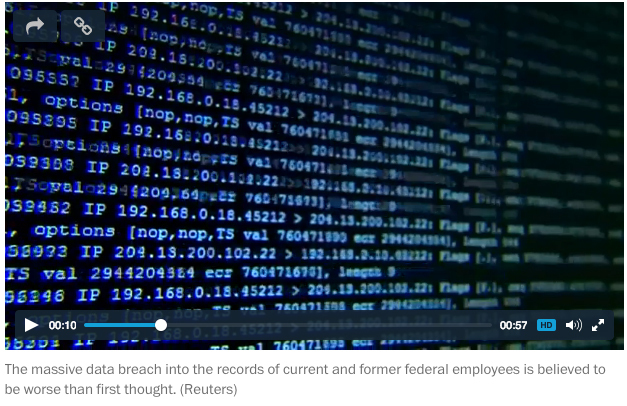 's secretly hunting for hackers (see the New York Times story here)—are a drum beat of unmistakable lobbying for more cybersecurity dollars which will be flushed down the federal toilets. Big, centralized efforts don't stand a chance of succes, and that's not their real purpose. Their real purpose is to grease the palms of the Beltway Bandits, keeping the wheels of the military industrial complex well oiled. Licensed/bonded cyberprivateers are a solution that would work, albeit one that would cut out the Washington Fat Cats. Proof? 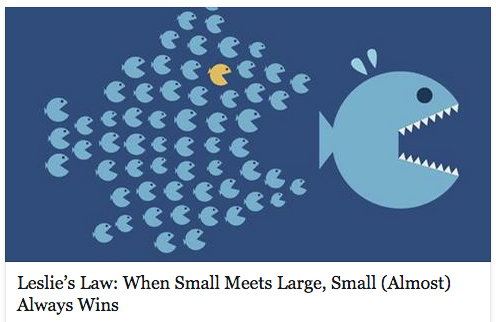 My old friend Mark Leslie coined what he calls Leslie's Law: When Small Meets Large, Small (Almost) Always Wins (see his firstround.com article here).